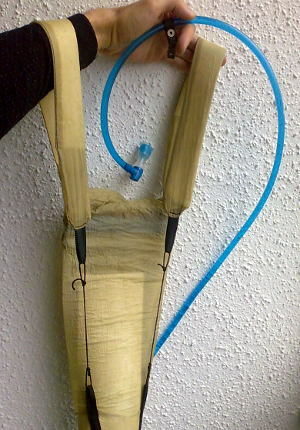 This is my DIY ultralight water bag. The bag itself, without the bladder, weighs 20 grams. Normally I do not need any “hydration systems”. In fact their justifications, like “hydrate or die” or “drink up to 24% more” sound completely idiotic to me; human beings lived without Camelbak for tens of thousands of years and did not die of dehydration. Exception for me are endurance winter bike rides with local Espoo cycling club IK-32. Water in bottles freezes while we ride for 5-6 hours non-stop in sub-zero temperatures – and it’s best not to hear the curse words about water bottles which come to mind in such case. It can easily mean that you quit the ride, founding yourself in sweat-through clothes within some 40 km towards home. Other riders carry water bottles in their jersey back pockets, but my jacket has pockets which are not really suitable for it. So I decided to try a camelbak. Unfortunately models in the store make my digestive tract to work in the opposite direction. Such simple thing as bag for the plastic water bladder is made of tens of various colorful cloth pieces, contains plastic foam padding everywhere, several strips and bindings all over the body, and weighs up to 500g! I’m not much of a weightweenie, but half-kilo for such appliance is really ridiculous. All this plastic foam and nylon base becomes completely wet during the ride, I’d have to carry half kilogram more of own sweat each time, and wash it each time at home. And for these rides, grams actually matter for me: it can easily mean keeping up with the group until the end or dropping out somewhere in the middle. I realized that I do not want to take any of these fancy ready camelbaks even for free. I bought just the plastic water bladder (was marked “Platypus”, weighted 120 g.) and quickly sew an ultra-simple nylon cover for it together with two thin, minimally padded shoulder straps. The latter attach directly to the top handle of the bladder. This creature weighs 20 grams and does not collect more sweat than the inner lining of the jacket. Last weekend this masterpiece was successfully tested. I didn’t drop out of the ride. Here is the map. It worked! It takes 2l of fluid, which seems to be just enough for me for a 6-hour ride. It weighs less than 2 x 1l. standard water bottles with holders. I’m taking it next time. See you on the ride! This entry was posted in Cycling, e by konstantin. Bookmark the permalink.